Widespread violence in Bangui, capital of Central African Republic (CAR), has left many people injured, while ongoing insecurity is preventing them from reaching hospitals for emergency treatment. 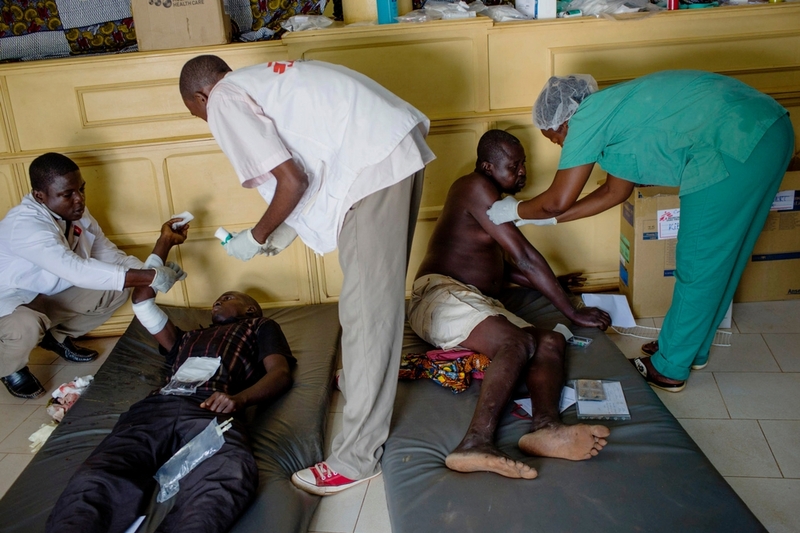 For the past three days, Médecins Sans Frontières (MSF) teams at three medical facilities across the city have been treating those people wounded in the violence who have succeeded in reaching medical care. This latest wave of violence was sparked by the killing of a motorbike taxi driver on 26 September. Since then, retaliatory violence and clashes, including attacks against international peacekeeping forces, have spread across much of the capital. At the same time, large crowds have been demonstrating against the current interim government, roadblocks have been set up in many locations, and buildings, including the compounds of a number of international organisations, have been looted and destroyed. Many people have left their homes and sought refuge in existing camps for displaced people. The MSF team in M’Poko, a large camp near the international airport, has seen several thousand people arrive over the past few days. Wounded case management in General Hospital after new wave of violence in Bangui. “MSF teams working in three locations activated a mass casualty plan to respond to an influx of wounded. "In the first two days of the violence, teams at M’Poko and Castors treated or stabilised 84 patients, while 97 wounded were admitted to the general hospital, one of the few hospitals with trauma and surgical capacity,” said Jane-Ann McKenna, Director of Médecins Sans Frontières. “Among the hundred or so wounded, 15 were severe cases and two were dead on arrival. "Most had gunshot wounds, but our teams also treated people with wounds from handheld weapons and grenade explosions. So far, a total of 45 patients have needed surgery,” she said. On 27 September, with all access roads blocked, wounded from the neighbourhoods around ‘PK5’, Castors and M’Poko could not reach Bangui general hospital and several people died while waiting for medical treatment. “Because of the insecurity, our ambulances can no longer move around town,” says Emmanuel Lampaert, MSF head of mission in CAR. “Where possible, we organise for patient to be brought to or from our facilities in taxis. But most of the sick and wounded now have to rely on their own means to cross town, either on foot or by motorbike. “Given the situation in Bangui, the number of wounded reaching our medical teams seems strangely low,” says Lauvin.